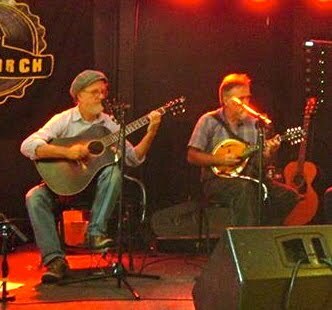 After thirty years working in the recording studios and orchestra pits of Nashville, TN, guitarist Jim Prendergast now resides in New Hampshire where he is a mover and shaker in New England’s thriving Celtic/Folk music scene. Bandleader for seven years at Findley’s Irish Pub in the Gaylord Opryland Hotel in Nashville, producer of CMH Record’s Celtic Tribute series, Jim now specializes in producing traditional music at his Mill Pond Music Studio in Portsmouth, NH. He is also a highly sought-after accompanist specializing in DADGAD-tuned guitar. Recent musical activities include concerts and gigs with banjoist Ken Perlman; piper Paddy Keenan; ﬁddlers Laurel Martin, Randy Miller and Ellen Carlson; guitar/mandolinists David Surette and Skip Gorman; and the ﬁlm soundtrack recording with Natalie McMaster and Joan Osborne. During his Nashville years, Jim was often called on for his deep knowledge of swing-style rhythm guitar, bringing his 1933 Gibson L-5 to gigs and recording sessions with the likes of accordionist Jeff Taylor (The Time Jumpers), and master ﬁddlers Craig Duncan, Buddy Spicher, Jonathan Yudkin and Barbara Lamb.